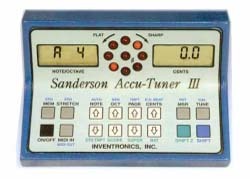 FAC 88-Note Stretch Calculator sets note & cents for entire piano automatically with just 3 measurements. Auto-Stepping Filter Circuit steps automatically to the next note. Double Octave Beat adjustment lets you create the perfect amount of stretch. Pitch-Raise Calculator gives accurate pitch raises in 20 minutes or less. Rotating LED display instantly shows tuning error to a resolution of ± 0.05 cents. Store up to 198 of your own tunings, with serial numbers. Memory that can be written and overwritten without limit. Tunings can be calculated with early music temperaments. Foot pedal steps up or down from note to note. Battery or AC operation with charger. PTG Tuning Exam program included. Small: 6” wide, 3” high and 4-1⁄2” deep.